Time for a marking pen giveaway, and a pattern giveaway for my Canadian friends! Let's start with the pattern. 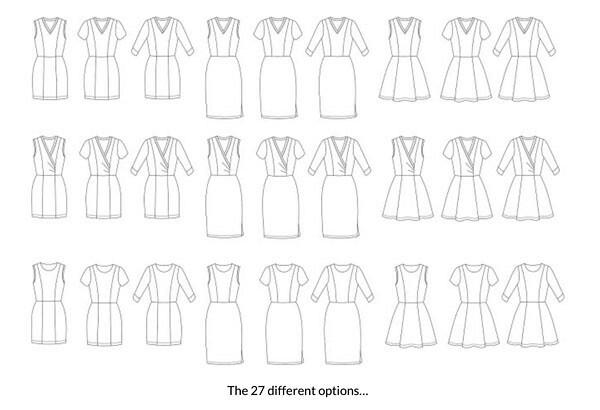 I recall reading some time ago that Simplicity and New Look patterns are no longer available in Canada. Is this correct? That seems weird, from a business point of view. Why would they stop? In any case, you know I really like New Look patterns, and this one is one of my favorites - despite the hideous version on the pattern envelope. Not sure what prompted me to buy it one day but I am glad I did and have used it several times, will certainly more to come. I found a new copy for 25 cents at a rummage sale so if you are in Canada I want one of you to have this pattern. 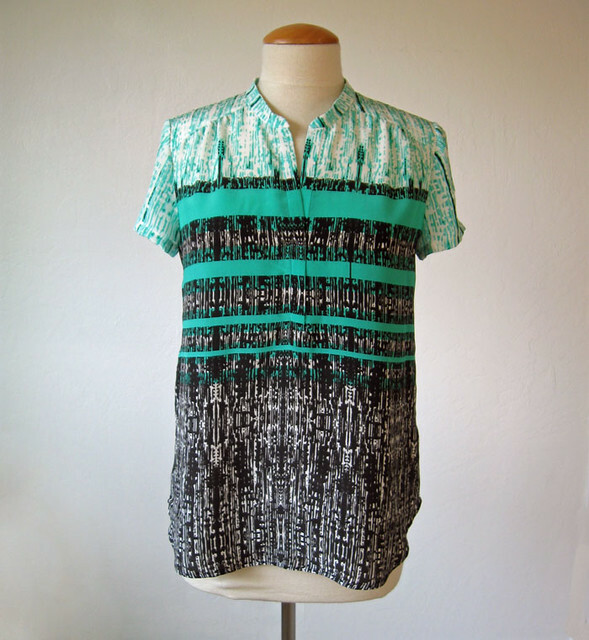 Here is the blouse I first made from this pattern. I wear it all the time but that could be due to the luscious floaty silk. As I have mentioned previous years there is a very old-timey store in Honolulu (Fisher) that is just shelves and shelves of stationery supplies, office stuff, pens, pencils, notebooks, everything that you could ever think of. And most of it is on the shelf, like the pens. Not in the packages...you can buy just 1 pen! and you can test them out. You can get every color Sharpie marker or 20 of just purple! Is it a bit silly to love office products? I know I am not alone, from the most gorgeous Italian paper and stationery palaces in Italy to the Japanese dollar store in my nearby mall, I love to check out stationery stores and always seem to find something. So now when I go to Fisher I stock up on these Frixon pens. Which are erasable on paper, and disappear with heat or ironing. Warning - as we have all probably read, the marks can come back in the cold, but come on - for sewing use them for marking INSIDE the seam allowance and you will not have a problem! 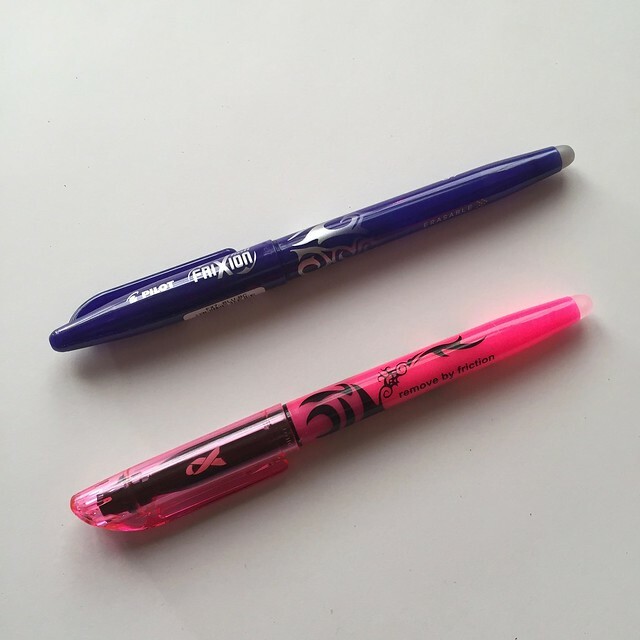 So I will give away 2 sets, a color Frixon pen and something new, a pink highlighter Frixon pen. Which I tried out and is really cool - makes a slightly thicker line and is easy to see. So, the catch....I would love for you to answer a question. Now that I am teaching classes on a variety of topics I find that the things people want to learn, or fixate on, or can't get the hang of are all over the place. 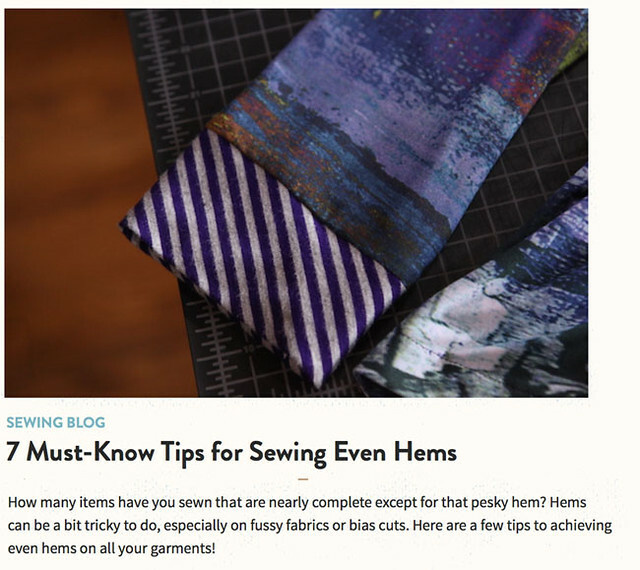 Obviously everyone is different but let me know what you find most challenging when sewing - other than fit. Like what technique is most troublesome and why. What part of the project you fear tackling, or what construction do you avoid because you just can't deal. 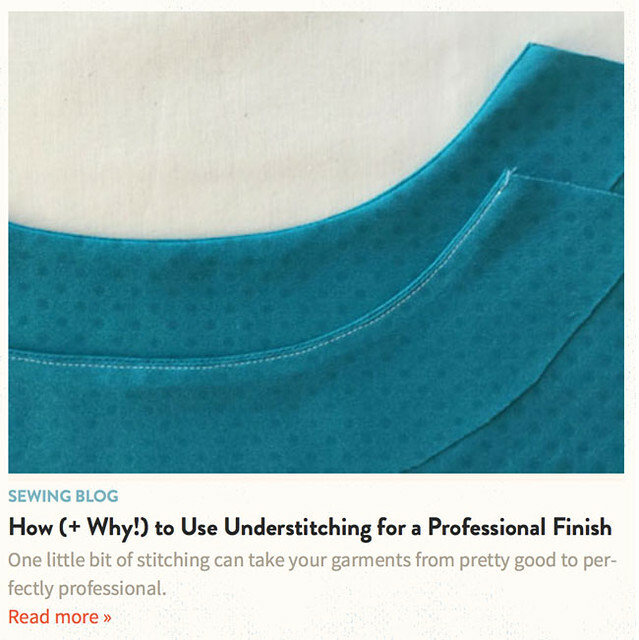 Please leave a comment and let me know your sewing dilemma, and then I will draw names sometime next week. 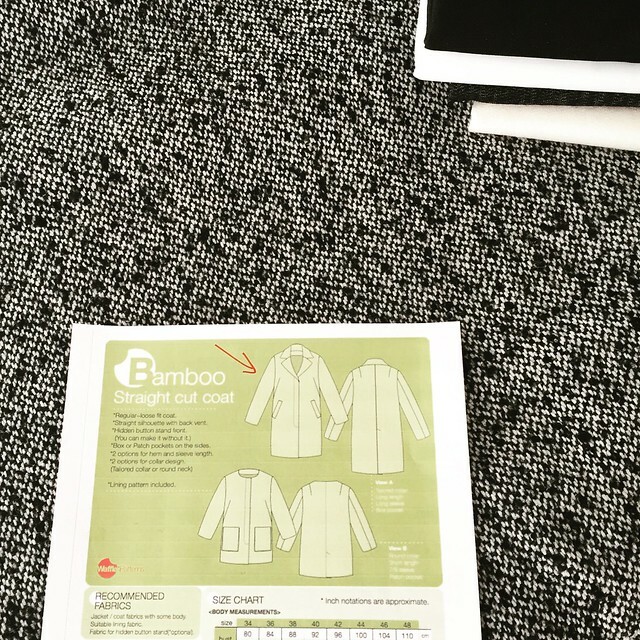 Canadians - I might have to do this again with a nice Simplicity coat pattern - there are a lot of good ones and it really boggles my mind that they are not sold there. Plus I am feeling very warmly towards Canada lately, our sensible neighbor to the north. Thanks to all for reading and commenting - I've been blogging now for seven years and I still really like doing it. I have a lot of sewing in the works for the next few months so stay tuned. By the way - this weekend I will be teaching my Weekend Jacket Intensive class at Hello Stitch Studio in Berkeley. We're putting another Jacket Weekend on the calendar in December so if you couldn't make this session look out for the next. Please don't mention to me that summer is over because I don't want to hear it! Fall sewing, wearing sweaters, being chilly, ugh. None of that appeals to me. As you know I am a super wimpy when it comes to winter or any cold weather - and I live in the very moderate, mostly Mediterranean climate of the bay area. So not all that cold - but it's all the other things. Falling leaves, getting dark earlier and earlier, too may Halloween/Thanksgiving/Christmas decorations in the stores already. 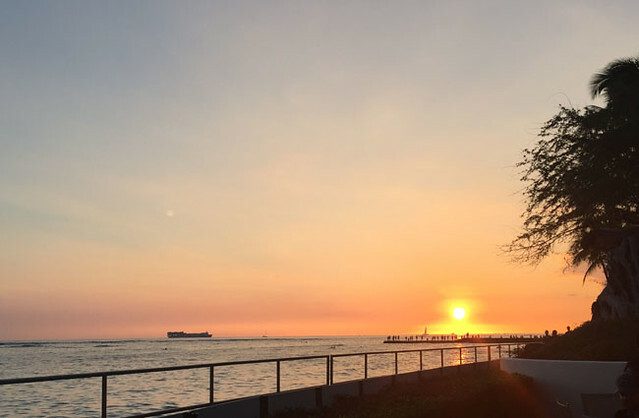 OK, the calendar said that our summer ended officially ended last week with the autumnal equinox but I am going to pretend it isn't so - at least for a few more weeks. I might even get to wear this dress one more time before putting it away until next year. 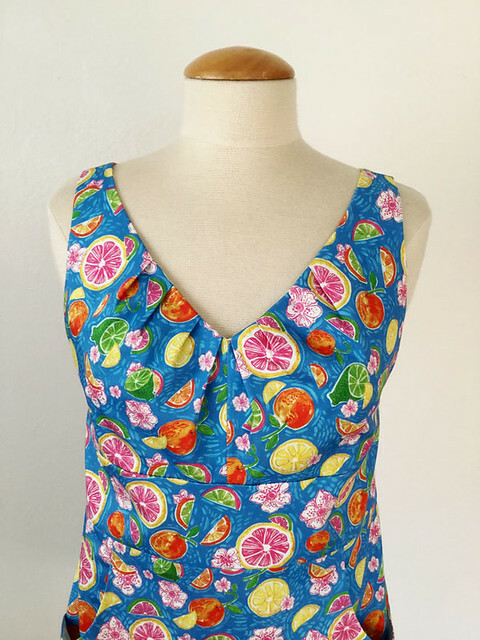 It really is a summer print which I fell for when I saw it on the Mood website, and had to include it when I ordered a fabric for someone else. Most years my birthday coincides with a beachy vacation (clever that way aren't I) and so this year I was planning to sew up this fabric with a new pattern. 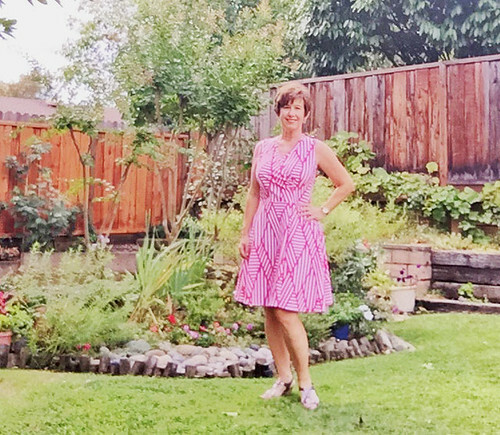 But I just ran out of time for playing around with a new pattern so I turned to my trusty Butterick 5455 which I have now made 12 ? times, including one other birthday dress. Here's some views on the dress form which show the detail much better, and also the color of the fabric. 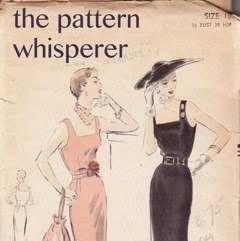 Here's the pattern envelope - it's out of print but you could find a copy on eBay. 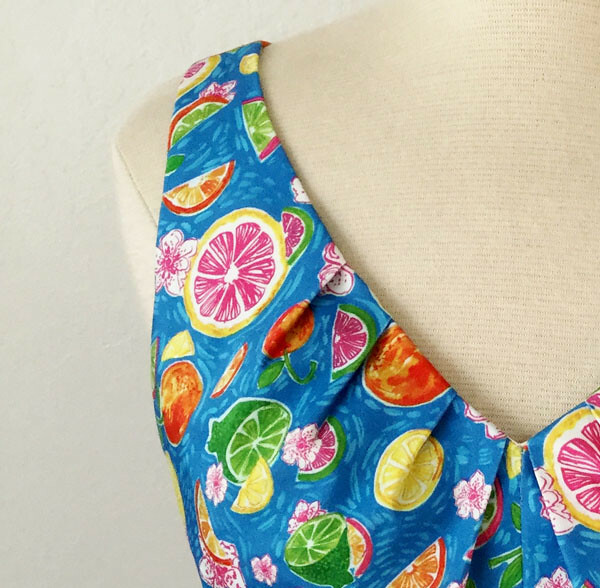 Do you think the fabric is a bit too cutesy and juvenile? Might be but I don't care, I love the colors and flowers + leaves + citrus is just so cheerful. 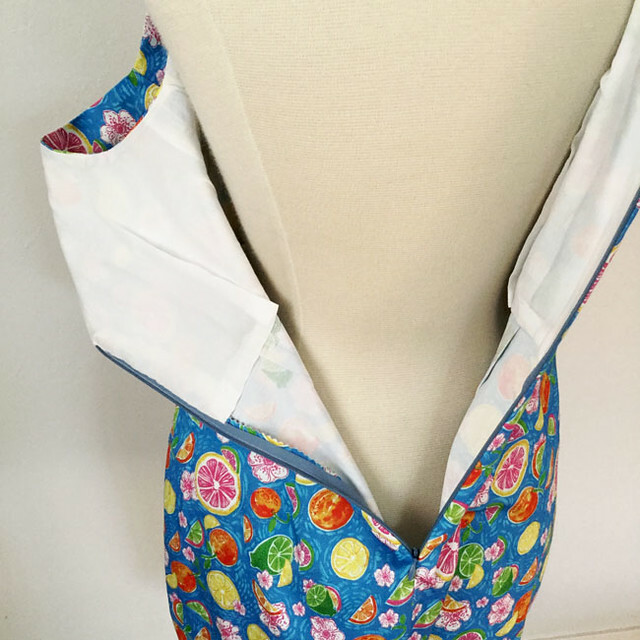 It's a stretch cotton sateen so super easy to sew, wear, etc. This pattern is one of my all time favorites because of the details. The pleating at the front neckline, the midriff band, the pockets that don't add any bulk, and back V, and the nice thin but wearable straps. I think sometimes you find a pattern that is just right for your proportions and even if you have to do some fit adjustments the basic shape is just right for your shape. I don't really have any sewing details...other than I think this might be my best invisible zipper in a V-neckline ever. No matter how long you have been sewing a little thing like that is so satisfying. 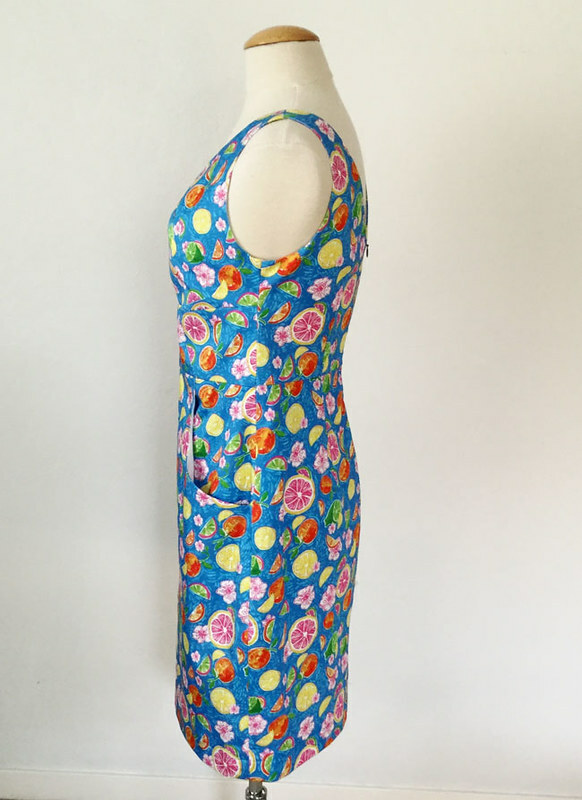 I lined the upper portion with cotton voile, and then with lightweight dresses like this I don't even sew the darts in the lining, just fold them as pleats inside and tack them down along with the edge of the lining at the waist. 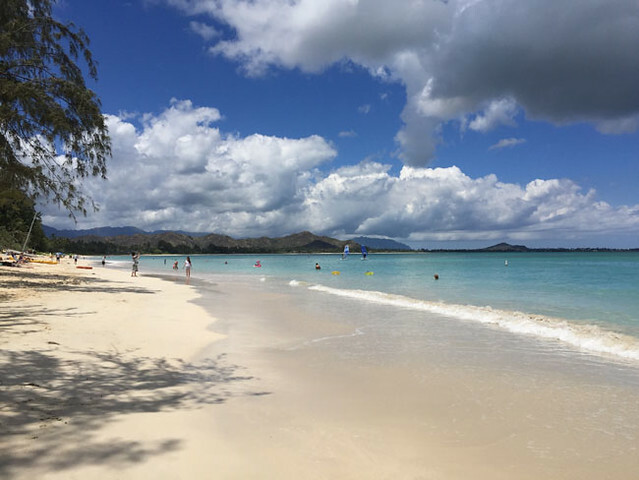 As I mentioned in my previous blog post - this year on vacation I took very few pictures, didn't spend much time online or email. Just relaxed and unplugged. And it was great. So I took a few more photos back at home of this dress. A couple more details, the pocket and the side view. So that's it for my last summer dress. 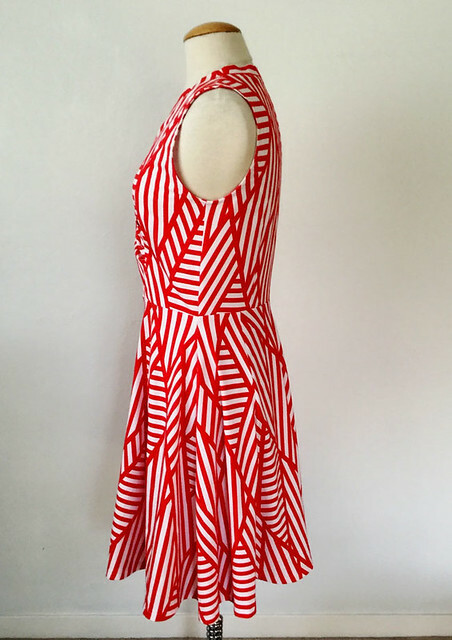 I love the colors so I will definitely be packing this one for my next tropical trip. Until then I'm starting another version of the Pauline Alice Aldaia dress, and doing some prep work this week for my Jacket Making class this upcoming weekend at Hello Stitch in Berkeley. And in November I'm going to do a class on copying an existing garment which should be interesting - I really enjoy doing that. Last one - with the garden appearing more green than it really is - after those dry hot days of August. And instead of garden shots - a couple of my iPhone pictures from vacation. I am always amazed at how well they turn out. Anyway, I will admit that having an iPad loaded with books does have it's advantages. Years ago my dad would just shake his head at the quantity and weight of books that I would pack, but what can you do? a three week vacation sitting on the beach, reading, swimming and breaking for ice cream is just about heaven to me but it does require bringing plenty of books. So e-books do have that advantage. Although I do miss the days of buying $1 used books at the library and saving them up for travel. With teaching classes at Hello Stitch, doing private lessons and sewing for a couple of people I really needed to step away from the sewing machine but now I'm rested and have plenty of posts to catch up on. 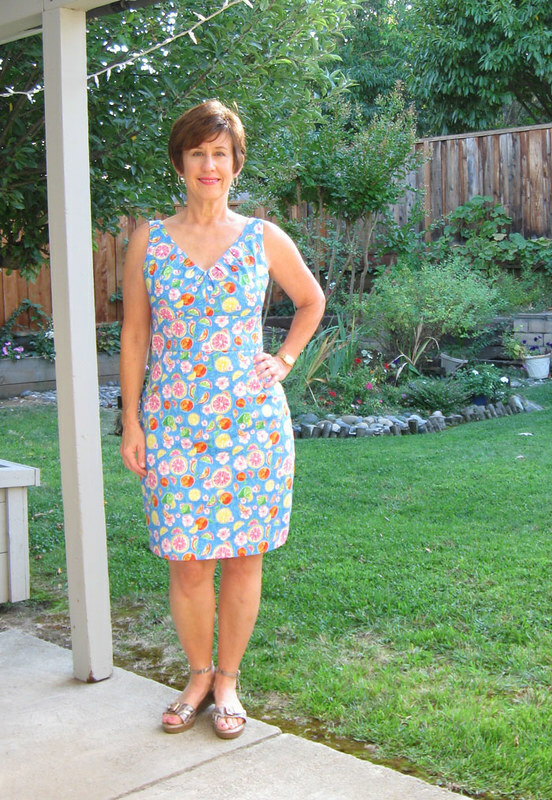 I will be teaching a class on Knit dresses starting Oct 21 so I wanted to sew this up and see how it goes together. My verdict - super cute and I am about to cut out another one, a winter version. 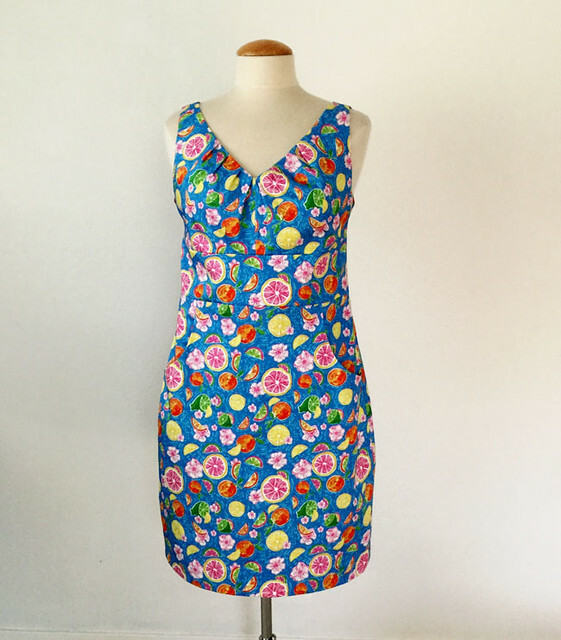 Note that for the class another option is the Turner dress by Cashmerette patterns. This photo is kind of blurry and has a strange exposure - I took it with the timer on my iPad. I also think I took some of these pictures on a day when it was over 100˚F so they were of the quick dash outside for photos and be done with it variety. It looks much better on the dress form. 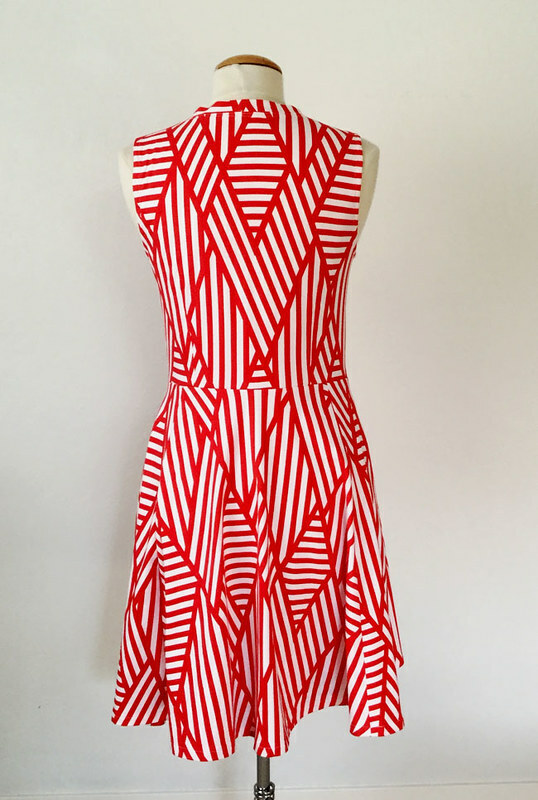 You can see that it is a true red and bright white print. I actually made this as a test version, the piece of fabric has been sitting in the closet for at least 2 years. I ordered it from Girl Charlee and when it arrived I thought it was a bit too busy - even for me. Also I just couldn't picture it as anything. However the weight of it was perfect for this pattern so I decided to give it a go. Once I saw it on the dress form I really like the fabric - although it still is a bit wild. 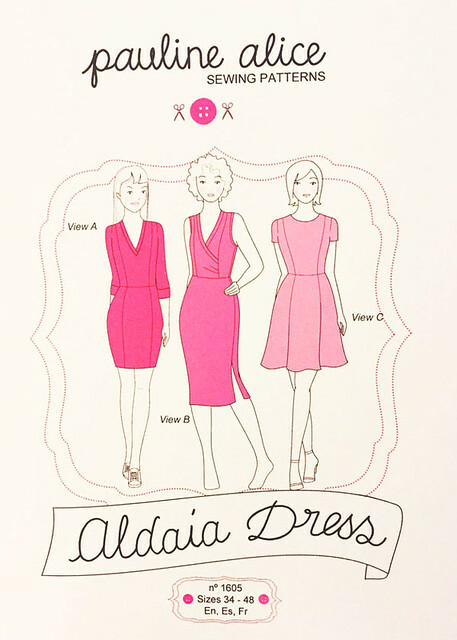 Here's the pattern, it is shown on the envelope with these three variations but in actuality you can mix and match all the skirt, bodice and sleeve combinations to come up with a lot of different looks. I copied this image from Pauline's blog to show the mix and match options - and it also would work well for color blocking. 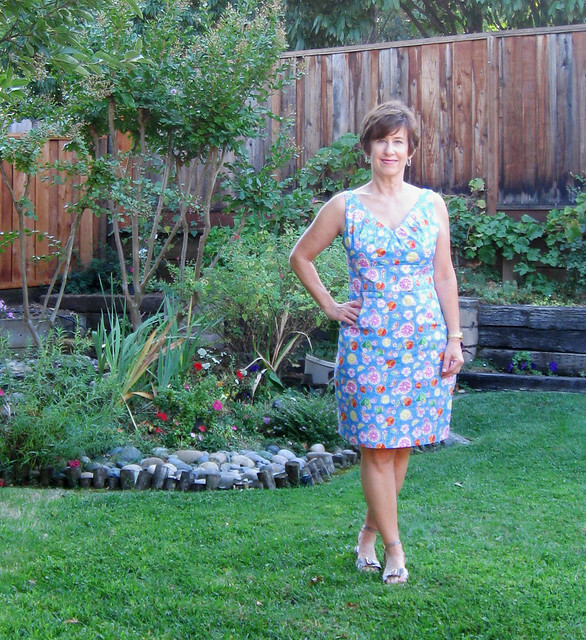 I sewed size 40 which is what I have used in her patterns before and the fit was really good. The neckband fit perfectly which is a nice feature. I also can see using this pattern as the starting point for a knit tee shirt. My fabric was a slightly strange width, it had a big white unprinted section on either selvedge so the actual usable part was nearing to 50" wide. 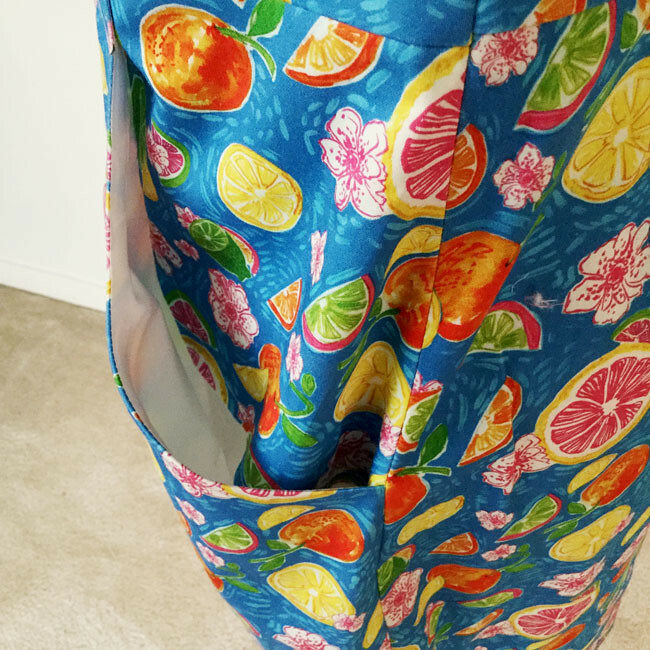 Because of this and only having 2 yards I had to reduce the width of the skirt, so I just pinched out about 2 inches from each skirt piece at the hem and then tapered that pinch to zero at the waist. And I don't even miss the fullness, in fact it seems right to me so I am not going to add it back for the next one. Other sewing details, I just sew knits on the regular sewing machine, with straight stitch. 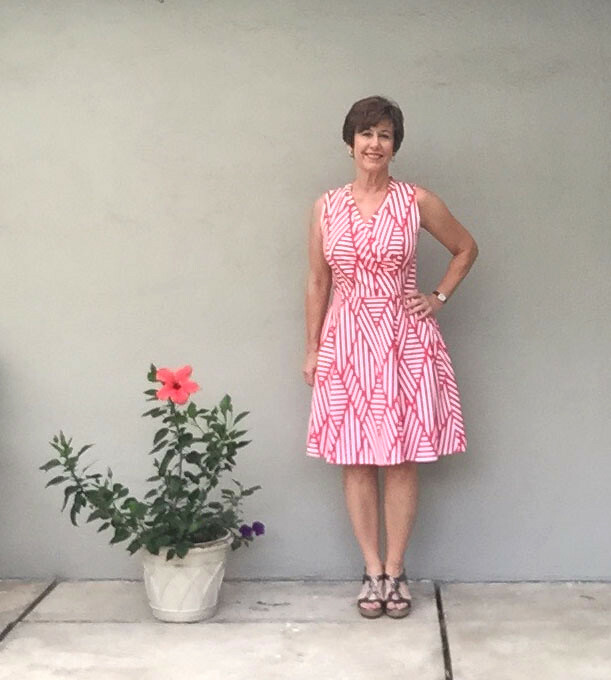 However - this dress has a very fitted waist, and after I basted it together I realized that I couldn't get it over my shoulders unless I used some type of stretch stitch. So I sewed the waist seam and the side seams with a small zig-zag and that was just right. I think I lengthened it about 2 inches so as designed it is kind of short. Another not so great photo - and the sky was really that color on the day when the fires in N. California were making very smoky and grey all over. Glad that has cleared up. Last weekend was my knit t-shirt class at Hello Stitch and it was full with some people on the waitlist so we are scheduling another session sometime in November. And coming up soon is the one I am really excited about - the weekend Jacket Essentials workshop. I am planning lots of demos of techniques and hands-on practice to making the perfect tailored jacket. 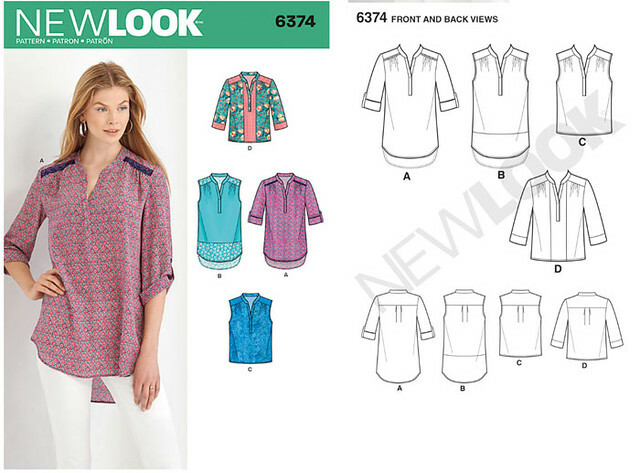 For some of the other classes, like the Button-front shirt, knit tee, skirt, dress and Fit Lab, these will be regularly on the calendar so check the Hello Stitch website. We are usually scheduling about 2-3 months out. 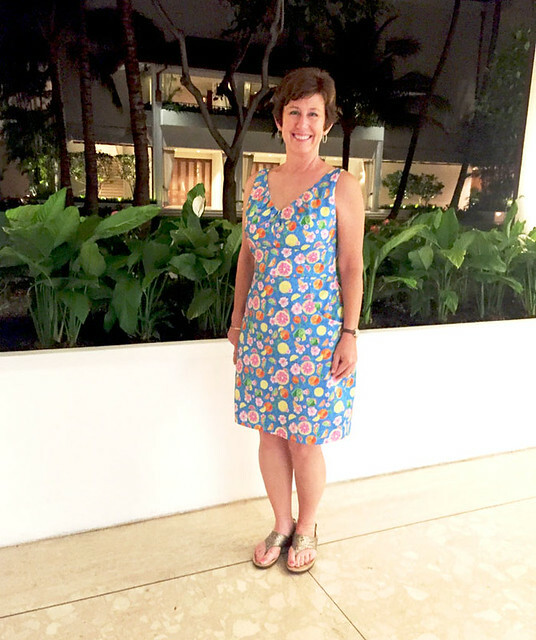 Next up is my birthday dress - my personal tradition to make a summer sundress type item to wear on vacation (nice how that all fits together, huh?) 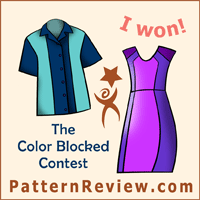 and then some giveaways, plus the Pattern Whisperer returns! So for those of you who are excited for fall sewing and wearing boots, scarves, sweaters, layers etc, I say...what is wrong with you? Well, to each her own sewing style and season. I look forward to seeing whatever you make! 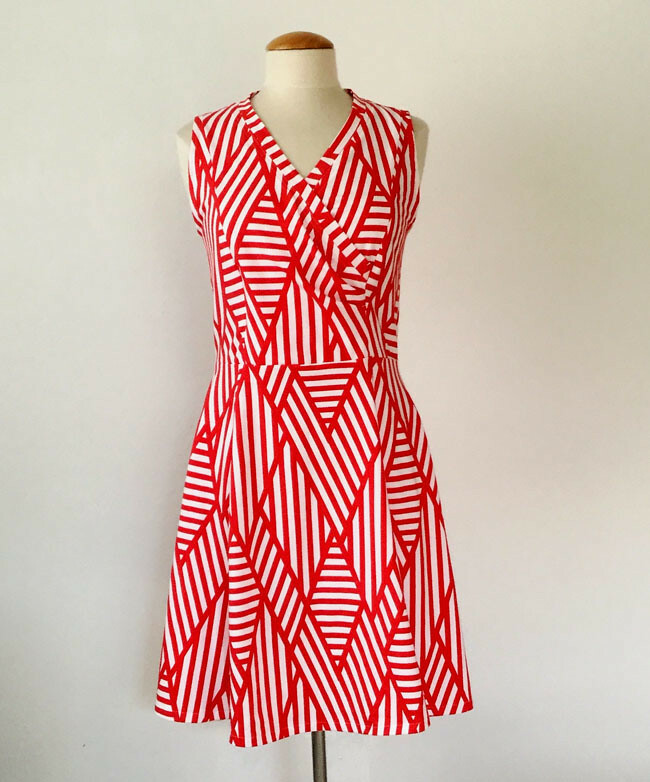 What better post to use this two-tone dahlia than with this two-tone dress? I have been waiting to post this one. 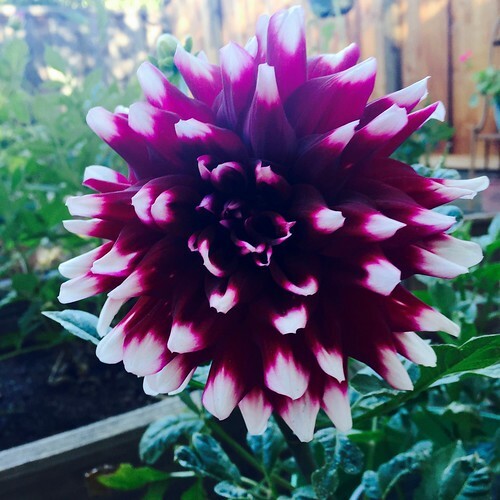 This was a great year for my dahlias and I have plans for even more next year. 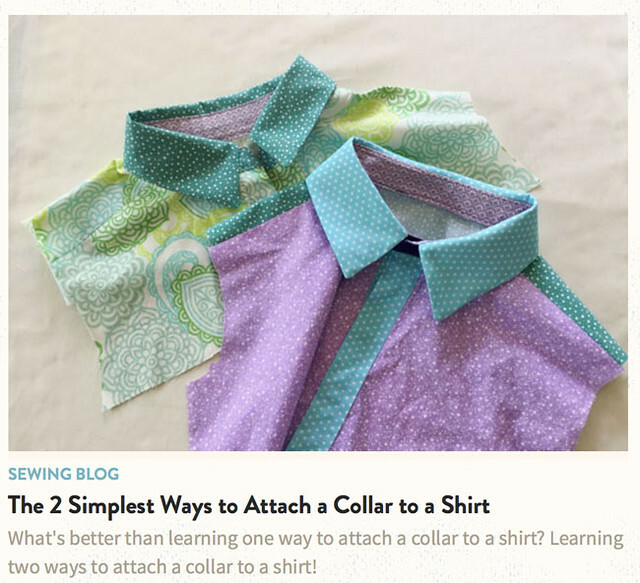 I've done so many posts on the Craftsy blog this summer that I've kind of lost track, and I like to link to them here in case you are interested in reading them. 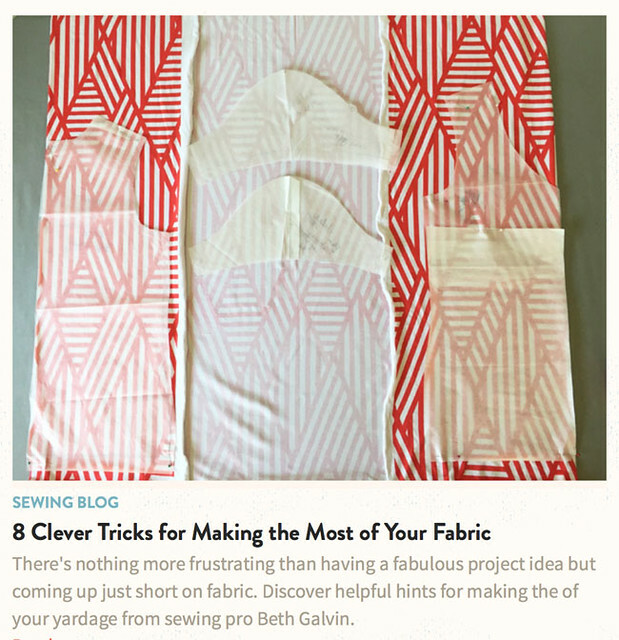 I've been trying to multi-task in a big way and chosen topics to write about that go along with things I'm preparing for teaching classes at Hello Stitch, and feel so clever when I can do one project and use it for multiple things 😊. 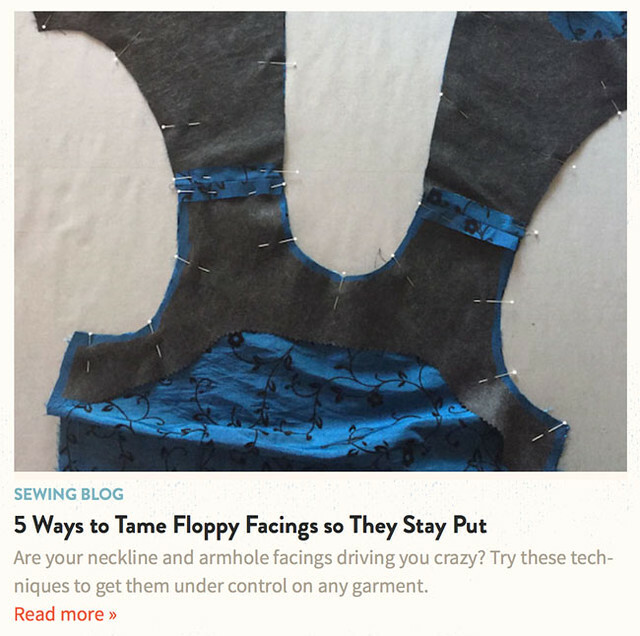 So here are some recent posts on the Craftsy blog. It always interests me which ones get a lot of comments, and which ones get pinned or shared more than others. I can never tell which will have the most readers before I do them, which probably keeps me on my toes! ➜ Note that I don't write the titles, nor the little excerpt that introduces the post. Well, sometimes I do, the "floppy facings" title I will take credit for...after all, that's what they are, sometimes. Links to the post appear below each one in blue. 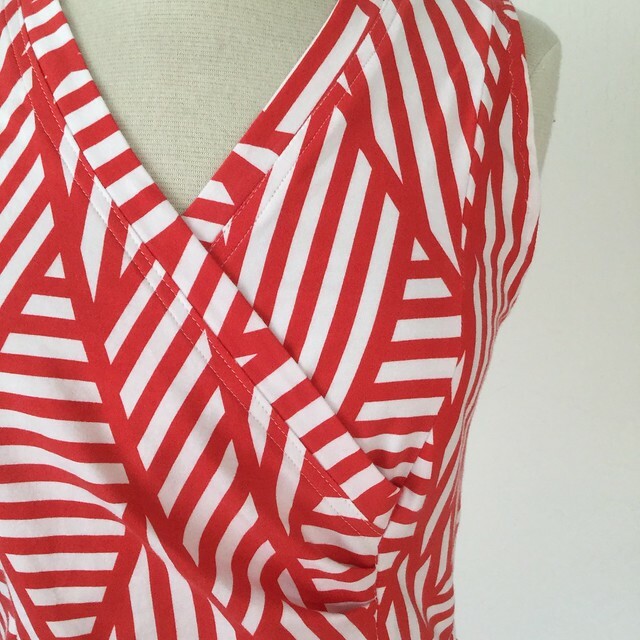 I used that white/red knit fabric just to stage the photo above of cutting out a knit top - and then promptly put it back in the fabric cupboard. Then I was working on some things for my upcoming classes, and it turned out to be the perfect fabric for one of my upcoming classes. So here's a sneak peek of a finished item, which I sewed as an example for my upcoming Knit Dresses class at Hello Stitch. 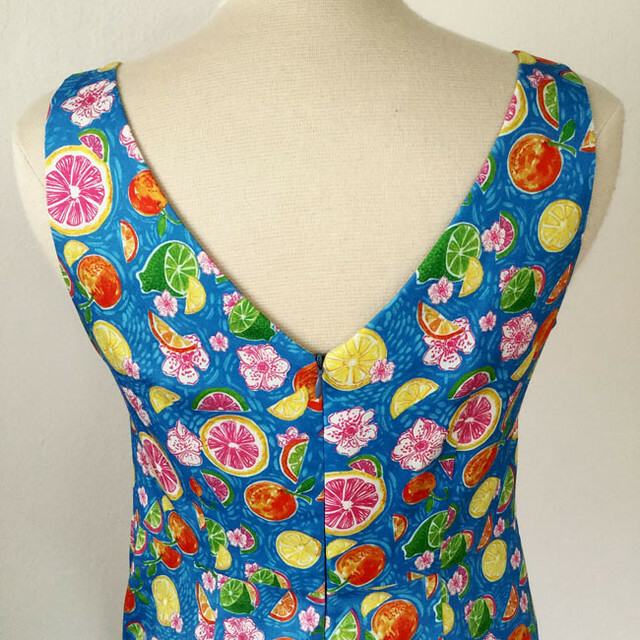 And another finished object, using this fantastic citrus print sateen I found at Mood fabrics. Just a peek, and I will post it soon. Can you guess the pattern I used? Hint - a repeat, of course. Upcoming in September and October I have some fun classes at Hello Stitch - well, they are fun for me to get deep into the details of jacket making, shirts, knit tops etc! The leaves are actually falling already however today is the first day in about five days that the temperature was below 100˚F here (yes it was 113˚F one day, eek!) and so it doesn't seem like fall. And I am NOT about to start fall sewing. So stay tuned for as many summer items as I can squeeze in. 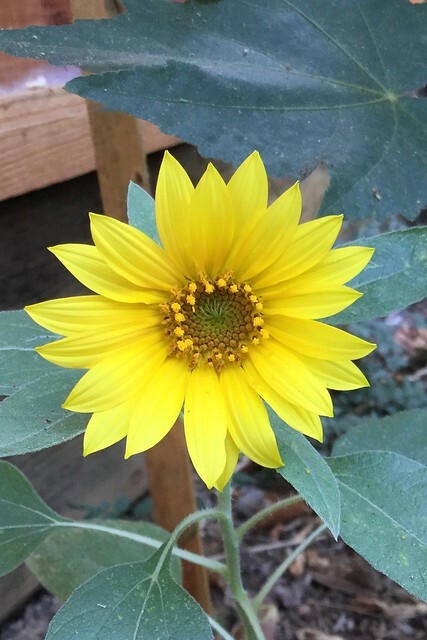 Today's garden photo - this little sunflower was a volunteer that popped up in a not so sunny spot.